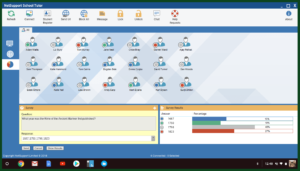 As the use of technology increases in schools, classroom management solution NetSupport School provides teachers with the tools to help monitor and manage students in technology-led instruction in a Chrome OS environment – as well as all other platforms. With NetSupport School, teachers can manage students’ Chromebooks from their own PC or Chromebook and use its range of award-winning features to assess, collaborate, control and manage the classroom– making it the perfect solution for teaching and learning in a Chromebook classroom. Teachers and students will remain top of the class with these easy-to-use features that keep students engaged and on task, and allows teachers to maximize lesson time and boost learning outcomes. Enter your details below to register for your free 30 day trial. NetSupport School delivers a perfect solution for a Chromebook classroom, offering both a Tutor app for Chrome OS and a Student extension for installation on each student device. Compatibility is also provided for an instructor using a Windows desktop to manage student Chromebooks and other platforms. 2. NetSupport Name & Connectivity Server (NCS). Also referred to as the Gateway. Installed on a Windows PC and used to manage connections between the Tutor and Student. Are you a Windows Instructor connecting to a Student Chrome device (plus other platforms)? 1. In this scenario, please choose the ‘main download’ option to install the Windows Tutor onto the instructors’ desktop PC and the NCS (select Custom install) onto the required Windows Server. Our Installation Guide provides more information. 2. Next, download the NetSupport School Chrome Student extension from the Google Chrome Web store on each of the students' Chromebooks. It is recommended that the deployment of the Student extension is centrally managed in the Google Admin Console. 3. To connect to additional platforms, download the relevant NetSupport School Student app on each of the students' devices. Are you a Chrome Instructor connecting to a Student Chrome device? 1. In this scenario, please download the NetSupport School Tutor for Chrome app from the Google Chrome Web store onto the instructors’ Chromebook. 2. Next, select the ‘main download’ option to install the NCS onto the required Windows Server (Custom Install). Our Installation Guide provides more information. 3. Lastly, download the Student extension from the Google Chrome Web store on each of the students' Chromebooks. It is recommended that the deployment of the Student extension is centrally managed in the Google Admin Console. Are you a Mac Instructor connecting to a Student Chrome device? 1. In this scenario, please download the NetSupport School Tutor for Chrome app from the Google Chrome Web store. 2. Next, choose the ‘main download’ option to install the NCS (select Custom install) onto the required Windows Server. Our Installation Guide provides more information. This is required to connect the Chrome Tutor to the Chrome Students (via the browser on the Mac instructor device). 3. Download the NetSupport School Chrome Student extension from the Google Chrome Web store on each of the students' Chromebooks. It is recommended that the deployment of the Student extension is centrally managed in the Google Admin Console. 4. Once 1-3 steps are complete, open a new browser tab and click on “Apps” and click NetSupport School Tutor app (If the previous screen from the Web store is still open, click on “Launch App”). 5. With the NetSupport School Tutor app opened, input IP Address, Port, and Gateway Key. 6. Instructors can now can assign a room or provide a user list. Once complete, the instructor can click “Connect”. The main download option contains all desktop components: For Instructor, Student and Technician PCs and includes the NetSupport Name & Connectivity Server (NCS). To install multiple components on the same PC select ‘Custom’ installation. Windows XP (SP3), 2003(SP2), Vista, 2008, Windows 7, Windows 8, Windows 10. NetSupport School operates in Terminal Server, Thin/Zero Client, Virtual Desktop and shared-resource computing environments and is supported on Google Chromebooks, iOS and Android tablets. Mac and Linux support also available with NetSupport Assist.